Every time I sit down to watch the minor league games each day, there’s always a dilemma on which to watch. Such was the case yesterday. There was Keegan Thompson starting in Myrtle Beach at 6 o’clock, who I had not seen as a starter yet. And then there was my guy, Jose Albertos, who was making his 2018 season debut for South Bend. Since Trevor Clifton pitched in the morning, I thought that I would make it my duty to check out Jose. There’s no secret as to my thoughts on Albertos. 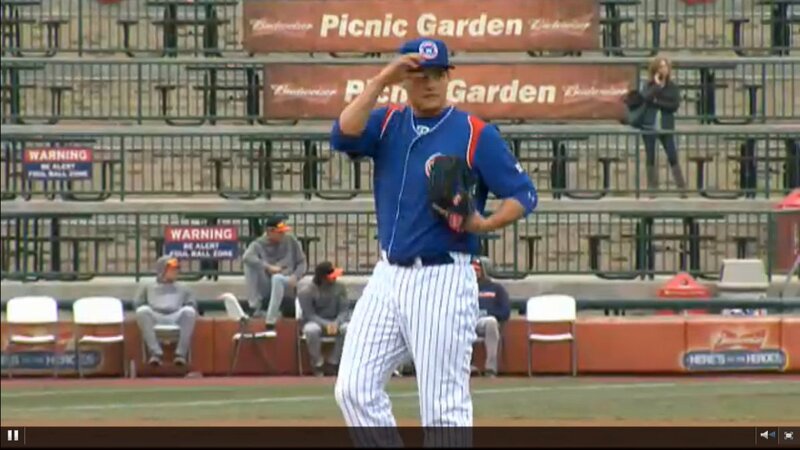 The 19-year-old right-hander is my number one prospect in the Cubs’ system as he has the highest ceiling. He has a mid 90s fastball, a plus-plus change up, and a developing curveball. For 2018, his objective should be to continue to develop the curveball and to get over 100 innings this season. As the day went on, I got extremely excited to watch him pitch. It had been cold the previous two nights at South Bend with temperatures in the 30s at game time. On Wednesday, during the day, temperatures were in the low 60s. So I felt good that Albertos would acclimate to that kind of weather. When he took the mound in the first inning, he was wearing a ¾ length undershirt. All signs were pointing up. He also looked like he’d lost a few pounds. Jose got the first hitter to whiff at a change but then gave up a single, a SB, and then a walk. A wild pitch then moved up the runners to second and third. After walking Brendan McKay, Albertos was at 20 pitches with just one out. Albertos was able to coax a fly ball that scored a run. Now with two outs, he was at 25 pitches. He threw a curve that traveled about 58 feet and resulted in his third wild pitch and another run. After thirty pitches, the inning ended. Only 15 of them were strikes. For inning number two, Brendan King took the mound. Jose was done. Usually, at low Class A, 30 pitches in the first will end your evening as a precaution. Considering Albertos’ injury history, the Cubs were not going to take any chances. There were not many positives to take away from his start. HIs fastball command was off. He looked to nibble, he didn’t attack the zone, and he didn’t throw strikes. He threw a change once, which is his best pitch. And his curve still needs a lot of help. And to be quite frank, he was one pitch away from ending that inning. A key grounder could have gotten a double play to end it and we could be sitting here talking about his great debut and how he worked out of trouble in a 21 pitch first inning. And, really, that’s all it was. One bad inning. It was not catastrophic or career threatening. He’s still just 19. As a top prospect, there are a lot of expectations heaped on someone who has attained that status. In the big scheme of things, he can learn from it and improve upon his approach and lose any butterflies he might have had. Last night was not his night. There will be a lot of other starts this year for him to show us what he can do.